VR-Zone's Chinese site has posted an official-looking roadmap that has an Intel 335 Series SSD scheduled for the third quarter of this year. Only a 240GB model will be released at that time, with 80GB and 180GB variants supposedly following in the first quarter of 2013. The 335 Series will reportedly use the same SandForce SF-2281 controller as the Intel 330 Series, except with newer 20-nm NAND. 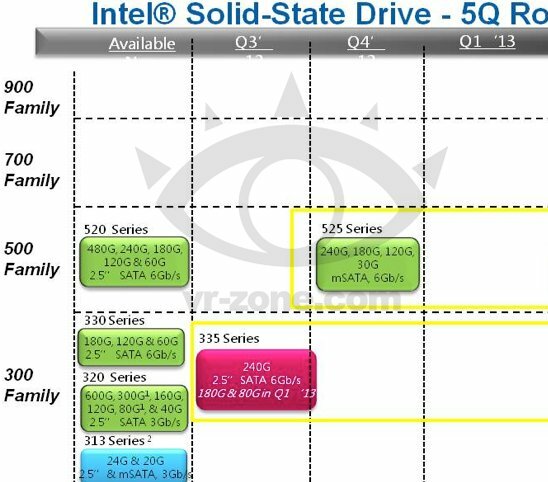 According to the same roadmap, the Intel 525 Series will debut in the fourth quarter. This new addition looks like an mSATA version of the 520 Series, which pairs the SandForce controller with 25-nm NAND. The 525 Series won't make the jump to 20-nm NAND, VR-Zone says. The site also notes that Plextor's M5P SSD with 19nm Toggle DDR NAND will arrive in September. This model features the Marvell 88SS9187 controller and promises 540MB/s read speeds, 450MB/s write speeds, 94,000 read IOPS and 86,000 write IOPS. It will ship in capacities of 128GB to 512GB.